Bungalow of a British army officer and his wife stationed at Bhuj (Cutch). bl.uk > Online Gallery Home	> Online exhibitions	> Asia, Pacific and Africa Collections	> Bungalow of a British army officer and his wife stationed at Bhuj (Cutch). Bhuj was the capital of the former princely state of Kutch, located in the Western part of Gujarat. It is an old walled town full of palaces, pavilions and highly decorated Hindu temples. 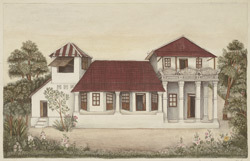 The bungalow seen in this drawing has a two-storeyed addition with an elaborately decorated balcony on one side. Hollyhocks and sunflowers thrive in the garden.